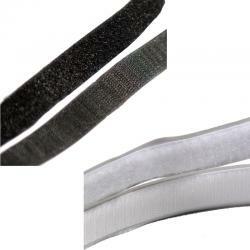 Quality hook and loop tape with adhesive. Backside includes paper protected attachment adhesive. Great adhesion to even hard surfaces. Glue meant to ease assembly before sewing, riveting etc. or to attach on hard and solid surfaces. Glue doesn't hold in cold temperatures. Does not attach permanently to textiles.